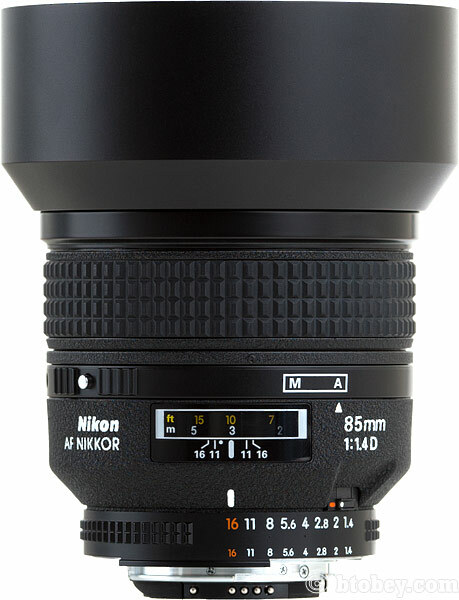 The Nikon 85mm f/1.4D is one of Nikon’s best lenses. Considered a classic for its magnificent bokeh, backgrounds just blur into a dreamy abyss. Sure there are many alternatives, but none quiet like this. Nikon has recently updated this lens, enhancing the autofocus by adding a silent wave motor, and modernized the look and feel. 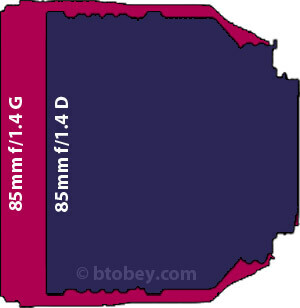 The newer version is titled, “85mm f/1.4G AF-S”. However, this 85mm f/1.4D should not be overlooked. It comes at nearly half the cost and still produces amazing images. This review will focus on the 85mm f/1.4D and compare and contrast it to other Nikon alternatives, such as the Nikon 85mm f/1.8D and newer Nikon 85mm f/1.8G. 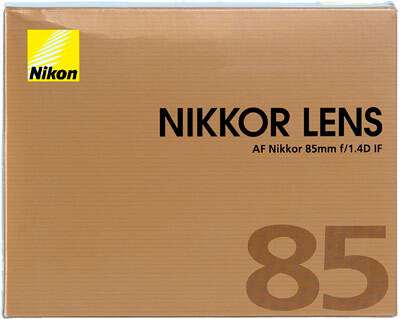 The Nikon 85mm f/1.4D was first produced in November 1995. Since then about 90,000 have been produced worldwide. Built for professional use, this lens can be seen everywhere, from weddings to street photography. It’s most commonly used for taking portraits. However it works great for all types of photography. 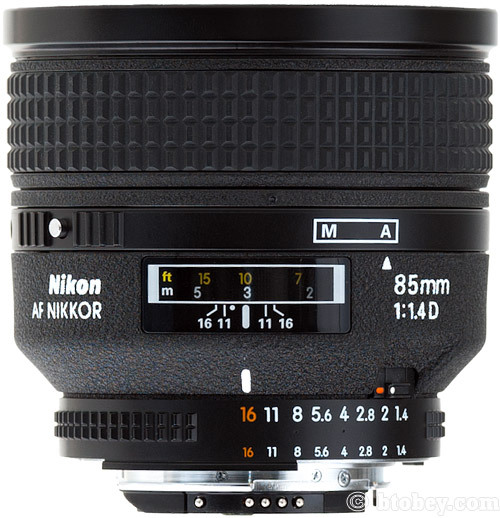 The 85mm focal length is ideal for a walk around portrait lens. It’s fast 1.4 aperture provides great low light capability. It is sharp at every aperture, except, perhaps in the corners wide open. Overall it is a fantastic lens, and with the newer version available, you can pick this one up at a much more affordable price range. I would skip this lens for DX users. Entry level DX DSLRs do not have an autofocus motor, so autofocus will not work. DX users should consider a 50mm f/1.4 or the less expensive 50mm f/1.8G. These lenses have a similar focal length for DX users because of the DX crop factor. The primary use of the 85mm f/1.4 is for general portrait photography. Although with its large f/1.4 aperture, some would argue its primary use is low-light photography, and for good reason. However, a 50mm is better suited for low-light street photography because it is less susceptible to blur from handheld camera shake. The longer focal length of the 85mm provides a better perspective for photographing people. For studio portrait work, photographers usually prefer a slightly longer focal length and typically use a 105mm or 135mm. Not to say, this 85mm would not work well in a studio environment. There are a not many limitations to speak of. Obviously it is a prime lens and cannot be zoomed. It’s ability to switch to manual focus is a bit clunky. The newer 85mm f/1.4G features instant manual override, just grab the focus ring at anytime to manually focus. This 85mm f/1.4D requires you to push a button and turn a autofocus ring to switch between autofocus and manual focus. This is only a concern for those who find themselves switching between AF and manual focus and need to do it quickly. Although this lens lacks VR, I don’t consider it to be a limitation. 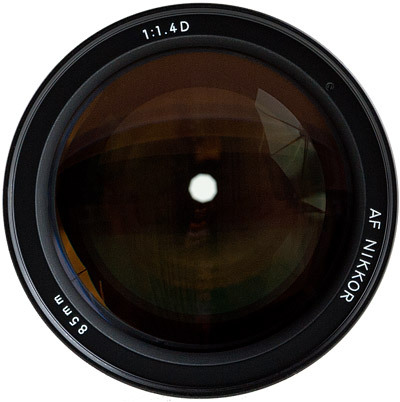 VR would be a cool concept for a lens like this, but I think there is some level of complexity that Nikon chose not to implement it. Or perhaps just the law of diminishing returns. This lens ranks among Nikon’s sharpest. Wide open, at f/1.4, it is sharp in the center, and by f/2.8 it is noticeably sharp almost everywhere in the frame. By f/5.6 it is sharp from corner to corner and can render over 70 line pairs per mm. One would think the newer Nikon f/1.4G AF-S would be sharper, and it is at f/1.4. However, this older 85mm f/1.4D is sharper when stopped down some. By f/2.8 it is sharper than the newer 85mm f/1.4G model. Test charts only show a portion of how good this lens is. This is because test charts are flat. This lens has a slight bend in the focal plane when shot wide open. So although the corners may not appear sharp in a test chart, in real life you may see sharper results. 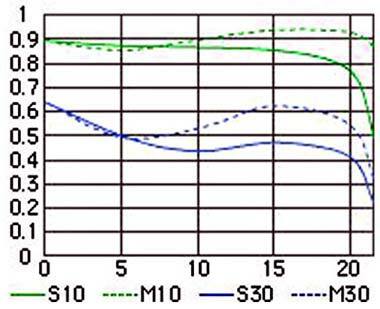 Nikon's published MTF chart shows the black to white, 30 line pairs per millimeter performance at f/1.4, wide open. MTF Measurements describe only a sub set of overall lens performance and should be used cautiously. MTF Measurements describe only a sub set of overall lens performance and should be used cautiously. Learn more about MTF. Distortion is almost zero. The 85mm f/1.4D hardly has any distortion. This is another area where it performs slightly better than the newer 85mm f/1.4G. Although distortion can be corrected for in post processing, it is still not a desirable trait. The less you do in post, saves time. Additionally if you decide to shoot video, this lens works great. This lens has some light fall off at the corners wide open at f/1.4. When used for portraits, it can be quite pleasing. Most of the vignetting is gone by f/2.8. The light fall off is not a huge concern and is quite good for a low-light telephoto lens. The grayscale images below show the light fall off across the first few apertures. Longitudinal (Axial) chromatic aberration cannot easily be corrected in post processing. Unfortunately this lens exhibits some between f/1.4 – f/2.8. The image below shows an extreme example of a high contrast environment to demonstrate the longitudinal chromatic aberration. You can see the green and magenta edges. Objects in front of the focal plane exhibit magenta edges, while objects in the back have green edges. The large front element is susceptible to flare. Using the hood greatly reduces the likely hood of flare. I leave the hood on always. The newer 85mm f/1.4G is better and less susceptible, partly because of its nano crystal coating. This lens produces accurate vibrant color. Bokeh is among the most common reasons why photographers purchase this lens. 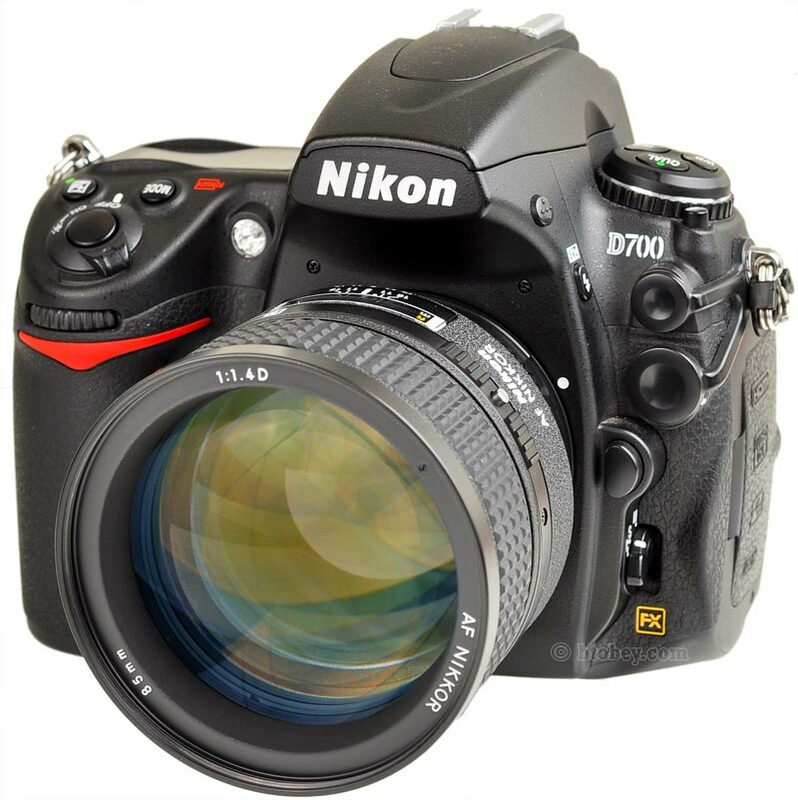 It ranks near the top of all Nikon lenses in this category. There are only a few other lenses that produce equivalent or better bokeh: 200mm f/2; 300mm f/2.8; 400mm f/2.8. What is the bokeh? Bokeh is the quality of the out of focus area of a lens. 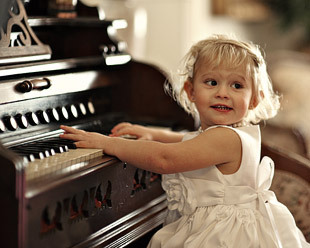 Great bokeh is considered to have pleasing Gaussian blur, blending light smoothly with linear additive overlay. Read more on bokeh. The image to the right shows the inner diaphragm at f/2.8. You can see its a 9 rounded blade diaphragm. Although the diaphragm is not the only factor of great bokeh, it does help to have rounded blades to produce pleasing out of focus circles. The 85mm f/1.4D's diaphragm remains circular through f/1.4 - f/2.8, and becomes more polygonal beyond f/2.8. 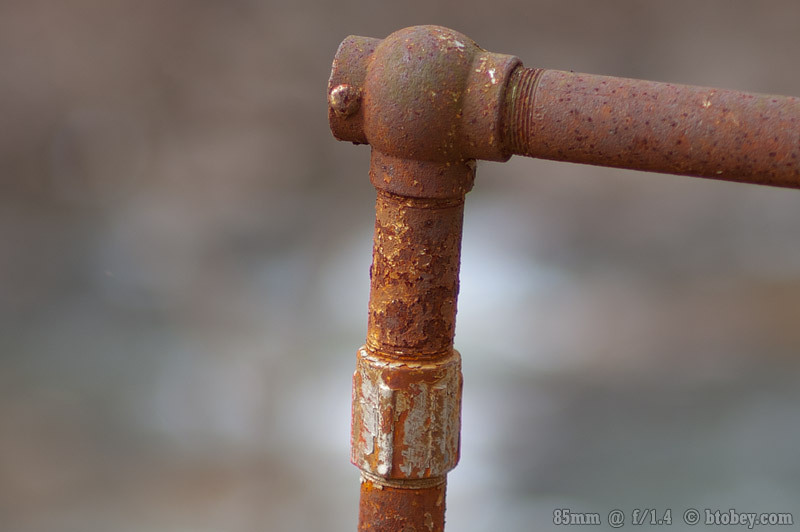 The below example is not the best example to show off the bokeh, however you can traverse through various f-stops to see how the background blur varies. The background in this example is set back far, so the blur is significant. The example is not 100% crop and has been resized, yet it retains the bokeh characteristic of the lens and shows it accurately. NOTE: the images are not pre-loaded so it takes a sec to load. The lens handles like most of the mid 1990’s professional lenses. It has a rugged large focus ring that rotates slowly enough to control focus accurately. To switch between manual and autofocus requires you to turn a ring and press a release button. This is a bit old school and the newer 85mm f/1.4G has a better design. 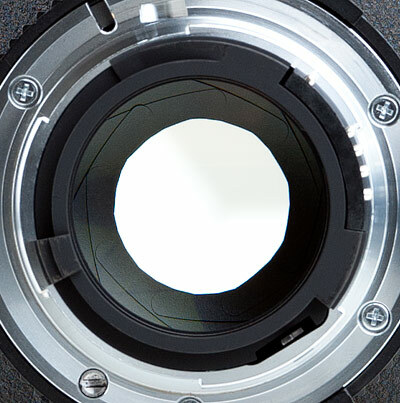 The aperture ring is built tough. Autofocus is important with an f/1.4 lens. All of Nikon’s digital SLRs do not have a prism that can render the shallow depth of field at f/1.4, so manual focus is not accurate below f/2.8. Therefore, you must rely on the autofocus system. The good news is the autofocus is fast and accurate for a screw drive autofocus system. It’s autofocus is more accurate than the cheaper 85mm f/1.8D. However, its autofocus speed is not as peppy as the newer 85mm f/1.4G, which features a built in AF motor. Overall there are no complaints with the autofocus of this lens. As a side note, it works better than the competitors, Canon 85mm f/1.2. Read more on Nikon's autofocus. It’s built tough. It was designed for professional use. Mostly metal exterior and interior parts. All modern Nikon cameras work great with this lens. However not all of them will be able to autofocus. This lens does not have an autofocus motor built in and is dependent on the camera to have an autofocus motor screw drive. Entry-level DSLRs, such as the D5100, D5000, D3100, D3000, D40, D60, D50, do not have a camera autofocus drive and rely on the lens to have an autofocus motor. Lenses with an autofocus motor are labeled AF-S. The “S” designates the lens has a built in Silent Wave Motor (SWM). Older film cameras will work great because the 85mm f/1.4 is built with an aperture ring. The 85mm f/1.4D is fairly large for a prime lens. It’s large size is attributed to its large aperture, which requires large diameter glass for greater light collection. The newer 85mm f/1.4G is even larger than this older model. The new one is larger because of the built in autofocus motor. You can see the size comparison in the image to the right. It takes 77mm screw on filters. 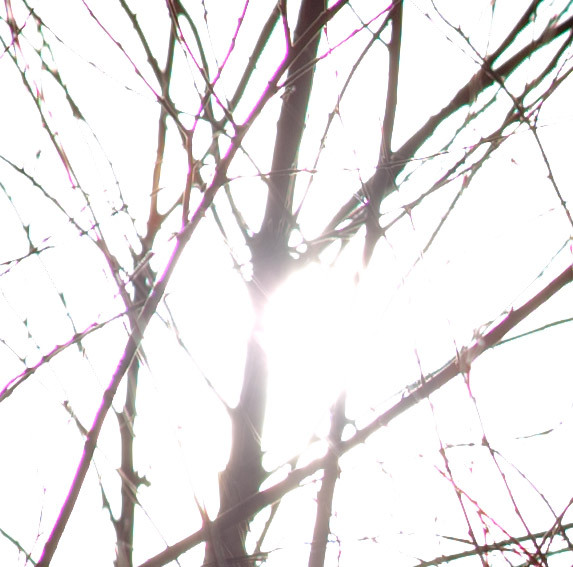 Vignetting may be an issue if you stack more than two filters. The metal (HN-31) hood is an older design. It is a screw in hood that screws directly into the filter thread of the lens. I prefer the modern plastic hoods which are easy to take off and on. The hood comes packaged with the lens and it is important to use to avoid flare. I leave it on all the time. 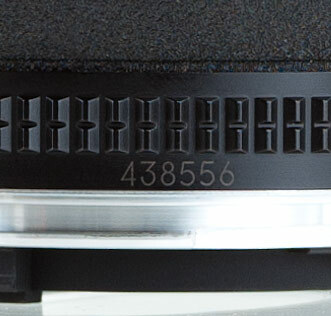 There have been three main production runs of the 85mm f/1.4D. It began in 1995 to 2004, with serial numbers marked 200000-229000. In 2005 there were just a few made with serial numbers marked 300000-301800. Later the final production was completed in 2010 with serial numbers marked 400000-459000. Before the release of the newer 85mm f/1.4G, I would have recommended purchasing this lens new. I bought mine on the gray market without a USA warranty. I have had no issues. It has worked great for several years now, and is still working like it was new. 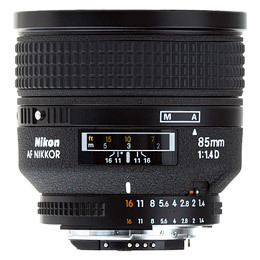 However, now that there is a newer lens on the block, I might consider purchasing this older 85mm f/1.4 used. I would look for one that has no scratches and with a newer serial number, something in the 400K series. Remember that this lens is built tough, so purchasing it used should not be a problem. The table to the right shows the top 3 auctions on eBay for the 85mm f/1.4D in used condition. Before purchasing, be sure to check the description and ask the seller questions. Sellers on eBay usually respond quickly. I would highly recommend this lens. Although it is an older lens, its optical performance is excellent and works great on today’s DSLRs. It is known for its spectacular bokeh, and holds true to its reputation. I would consider purchasing the newer 85mm f/1.4G AF-S if autofocus speed is a primary concern. However, the 85mm f/1.4D is similar optically. Sometimes the 85mm f/1.4G is not available, and you can usually pick up the f/1.4D at a discount used on eBay. I have been more than pleased with my copy of the 85mm f/1.4D and is among my most commonly used lenses. The cheaper Nikon 85mm f/1.8D I would skip. Although it is a great low light lens, its bokeh is atrocious. Stick with a nifty fifty if you want ultimate low light performance. Sure the 50mm is not quite the same perspective as the 85mm, but the bokeh is so bad of the 85mm f/1.8D that you might as well not consider it a true portrait lens. Save your money and just get the 50mm f/1.8G if you are looking for a simple low light lens.